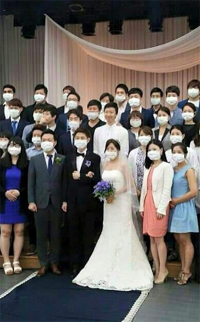 MERS Fear in S. Korea — Amid fear of MERS sweeping the entire nation a bride and groom, alowng with all the other guests wear a mask at a wedding ceremony recently held in Pyeongtaek, South Korea's Gyeonggi Province. MERS death toll rose to 19 as its patients increased to 154 as of June 16, 2015. Thousands of South Korean have been qualtarined either at home or at facilities. On June 11, 2015 the Bank of Korea (BOK) lowered base interest rates by a further 25 basis points to a historically low level of 1.50%, the fourth rate reduction since August 2014. The BoK justified the cut as a pre-emptive measure to ward off the economic damage caused by ongoing outbreak of Middle East Respiratory Syndrome (MERS). The South Korean economy has seen a modest recovery in consumption growth in recent months along with strong tourism arrivals. However, the MERS outbreak, which began in late-May, has hit retailers hard as people avoid public areas with large crowds, particularly shopping malls, restaurants and cinemas. Credit card use fell by 12.3% in the first week of June and F&B sales were down by 36% during the same period. Online retail is benefitting from the outbreak, however, as South Koreans opt to shop for food and daily necessities from the safety of their own home. Leading domestic retailer E-mart reported a 9.8% m-o-m drop in store sales in the first week of June but its online revenue increased by 45% m-o-m during the same period. Elsewhere, e-commerce retailer Wemakeprice reported a 300% y-o-y surge in sales volume during the first week of June. It appears, therefore, that the jump in online sales may somewhat make up for the drastic fall in store sales. The South Korea Tourism Organisation has reported a significant number of cancelled bookings by inbound tourists in recent weeks, a trend that has implications for the retail and hospitality sectors. The short term impact of the MERS outbreak on the sector has been minimal but could threaten resort areas such as Jeju should it fail to be contained. Top hotels in Seoul reported a slight decrease in bookings in the first week of June but mainly cater to business travellers. The effect of MERS and the rate cut on the commercial real estate investment market has been minimal thus far. Lower financing costs will create an even more favourable lending environment for investors. For many core property investors, it means the spread will become more attractive. Strong investment demand coupled with the lack of good investment opportunities is expected to push down yields over the course of 2015. With financing costs at historical lows, the rate cut is expected to induce further borrowing, leading to concern over household debt. However, the credit bubble is not a major worry at present and the BoK believes current levels of household debt do not pose a systematic risk. The BoK has also stated that the impact of capital outflows resulting from reduced interest rates will be limited.